The history of the Mastic Fire Department starts with Mastic Chemical Company, which was formed by fifty-two men from Mastic and Moriches. Joseph Titmus was elected Chairman of the early meetings, being the only member with fire experience. Numerous meetings were held, and after some disagreement, separate units were started in Mastic and Moriches. Subsequently, four men were elected sponsors for the Mastic Unit. They were Russell Ferrer, Anthony Tebbins, Harold Lukert and Thomas Eyton-Jones. The charter for the Mastic Chemical Company No. 1, better known as the Mastic Fire Department, was obtained from the State of New York on April 29, 1925. The Department started with a 1925 Brockway Chemical Pumper Truck and a Pierce Arrow. The contract was awarded to American LaFrance Apparatus Company for a chemical pumper on a 1925 Brockway chassis. There was a single 45 gallon chemical tank and two smaller 35 gallon tank. All water was discharged by soda and acid. The truck was delivered Around June in 1925. The first officers of the Mastic Chemical Company were: Chief Thomas-Eaton Jones; Foreman Jud Barry; Assistant Foreman B.G. Hurley; Secretary Thomas Doyle; Assistant Secretary Charles Trywusch; Treasurer A.H. Tebbins; Directors Theodore Whitehead, B.G. Hurley and Fred Squires; Finance John Kitson. In 1925, The Brooklyn Citizen Real Estate Company donated two lots in Section One, Mastic Park. This 40′ X 100′ parcel of land was the site of the first firehouse. The 24′ X 24′ building was built by members under the direction of Anthony Tebbins. The Materials were purchased and financed by Chapmans Lumber Yard in East Moriches. The materials were paid for by donations and efforts by the members at the end of the second year. Funds were raised by a large community auction and dance in the summer of 1926, held at the Mastic Community Clubhouse. In the latter part of 1926 a meeting hall was added to the firehouse, with the construction again supervised by Anthony Tebbins. It was completed sometime in 1930. A 1923 Pierce Arrow Utility Truck and a 1923 Reo Utility Truck were later added to the roster. 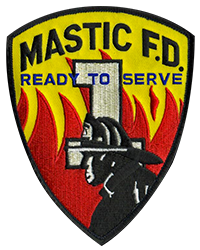 In 1927 the Mastic Fire District was formed. All properties of the Mastic Chemical Company were turned over to the Fire District. After this point in time, the Mastic Chemical Company No. 1 would become known as the Mastic Fire Department. When the property was turned over to the Fire District, a contract was signed whereby the fire department was guaranteed to have a meeting room and recreation room at all times. Should this agreement ever be violated, the original 40′ X 100′ site would revert back to the Mastic Chemical Company Number 1. On May 31, 1935 at 7:30pm the Mastic Firehouse was destroyed by fire. The cause was a faulty stove. The trucks were saved but all records and trophies were lost. On September 11, 1935, Thomas Eyton-Jones was awarded a contract to rebuild the firehouse. The years from 1925 to the 50 year anniversary in 1975 were well documented in our previous journal. Those years included fighting brush fires in Manorville for seven days, Duck Farm Fires, fires at a local church, businesses, Dana Estates, Patchogue Lace Mill Fire, Brookhaven, Mastic Beach, and many others. Greg Amato, 2nd Lt. Michael Guarino, Kevin Moylan, 2nd Lt. Robert Bautista, Michael Hall Sr., Steve Ricchiutti, Ex-Chief Henry Behrens, Steve Januszkiewicz, Michael Stellato, 1st Lt. Chris Del Vecchio, Gary Lombardo, Ex-Chief Rudolph Sunderman Sr., Elsie Farina, Michael Malone, Chief Rudolph Sunderman Jr., Flavio Gaspari, Eugene Martucci, Ex-Chief Rick Van de Kieft, Captain Patrick Greene, Ex-Chief Charles Mineo, Ex-Chief Steven Zaglool. Rebuilt Brockway returned to NYS Firemen's Museum in Hudson N.Y.
Old Blue Lantern burns down Montauk Highway & Midland Ave.
Mastic Fire Department responds to Ground Zero with an Aerial Tower and Heavy Rescue unit. Dept. Responds to working fire Ralph’s Italian Ices on Surrey Cir in Shirley.